BOOK your family photo session now, on this ONCE a year Special Family Photography Deal. Are you tired of not having updated family photos??? Need some gifts for grandparents for christmas??? This is a once a year special I run to help families have beautiful to keep for a lifetime. This could help you with christmas gifts, or simply to have beautiful images in your home of your family, ready to put straight on your walls. 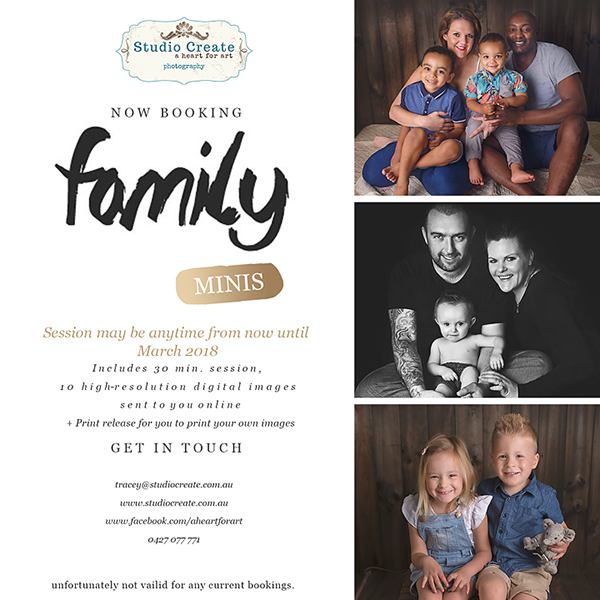 I’m a Melbourne multi- award winning Family Photographer located in Sunbury, and the images of our Family Photos hanging on my walls are some of my most treasured possessions. I invite you to come and have a session with me to capture your Family in photos. No hard sell. 10 high-resolution digital family photos for you to love, print, enlarge, gift and keep for a lifetime! All for the bargain half price session of $245.